Working in cardiac rehabilitation this was often one of the biggest challenges I would encounter on a daily basis. Getting patients to understand and perform a warm up prior to starting into vigorous exercise. Often our lifestyle has so many time constraints that people just jump right into the vigorous activity and neglect this critical part of the exercise session. 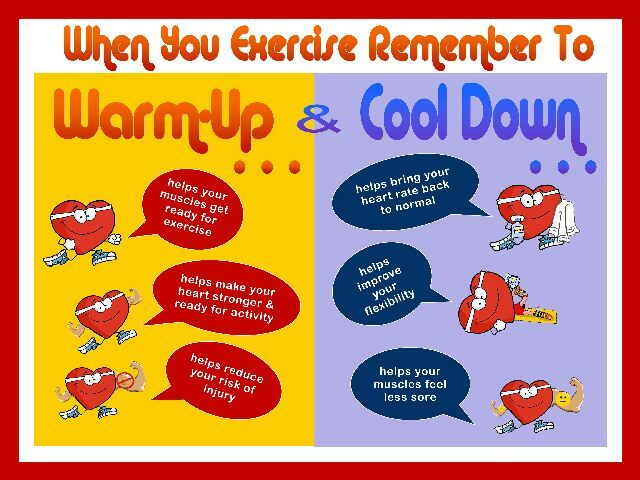 Warm up is starting into activity slowly to allow your vessels in the heart and muscles throughout the body to dilate. This takes 5-10 minutes to accomplish. The easiest way of warming up is to start into your activity at the lightest possible level both in the form of resistance and in the form of intensity or speed. Others will do slow walking or light calisthenics. Stretching is not a recommended warm up activity. One should actually warm up and get the blood circulating before stretching. Most programs recommend stretching after exercise as the muscles are more receptive. The dilation of the arteries or blood vessels makes there be less resistance for the heart to have to push the blood flow against. Remember blowing up a kids balloon, the kind that you can make shapes with. Think back to how hard it is to blow the air into the balloon, that is because the balloon is tight. Now if you stretch the balloon out it takes less effort to blow into it. Your heart functions similarly, it has to work very hard to push adequate blood supply out the tight arteries, but if you dilate them it helps. Some patients require a Nitroglycerine tablet prior to exercise to provide additional dilation as even light exercise can cause them angina symptoms without this. Be sure to discuss this with your healthcare provider if you think you require nitro prior to activity. The other way I would approach teaching this is to equate it to a car. If the cars engine was cold you normally wouldn’t go and rev up the engine or run the car hard before first warming it up, correct? This is because the car needs to get all the fluids circulating so it doesn’t hurt the engine. Well think of your body as the car and the heart as the engine. To prevent the blood from pooling in dilated vessels and putting undue strain on the heart of low blood pressure which can occur after exercise a cool down is recommended. Slowing the heart rate down, allowing the arteries to slowly return back to their pre exercise size are the physiologic responses to cooling down. Otherwise the blood pools in the large muscles used for exercise and doesn’t get sent back to the brain, heart and lungs adequately and often gives patients symptoms of lightheadedness, dizzyness or passing out. This is much more common in heart patients due to the medications most take. Similar to the warm up, slow the activity, decrease the speed and resistance. Allow a good 5 minutes of slow activity before stopping. One of the worst things is to go from vigorous activity to sitting or lying down. Slowly stroll around, stretch, do some light resistive training as cool down. Again the motor analogy, if you ever ran a motor really hard then suddenly stopped it, what happens? It can back fire or clog up. Well you don’t want either of these things to happen with the heart, so do a cool down! Health is only one topic for this blog, yet I tend to bias towards it for personal reasons. Also I know quite a few people, some of them friends, who are also undergoing cardiac issues. It is therefore appropriate to post cardiac specific information even if of no interest to the majority of readers.